Volume and Corporate Sales contact us directly. Plug and play, ready to use right out of the box. This package includes three 24 inch high quality digital energy efficient displays. Horizontally mounted to a cast aluminum pedestal, finished with a durable powder coated surface. Pre-cabled for ease of installation. Powerful interface to your computer - triple your on-screen desktop. 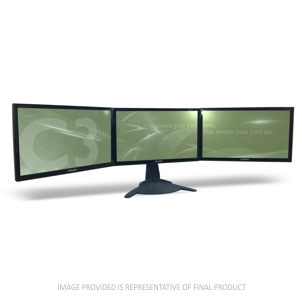 View screens as one, two or three desktops. Maximize one view across all three screens – a tremendous visual for those working with CAD tools, complex spreadsheets or project management software. View displays as one desktop or multiple desktops. Users can direct applications to appear on each screen or maximize an application across multiple screens. multiDisplays allow users to simultaneously view and efficiently interact with multiple resources. All aluminum pedestal requires only 13" of desktop depth. Pre-cabled and easy to assemble. Excellent display solution for demanding professionals who work concurrently with many applications or require an extended horizontal view of their work. Note: Display specifications may vary due to current OEM display supply. Do I need special drivers to run my massmultiples™? No, massmultiples™ do not require a special driver (with XP, Vista or Win 7). To ensure proper operation of your massmultiples™ please contact your graphic card manufacturer and install the latest graphic/video card driver.